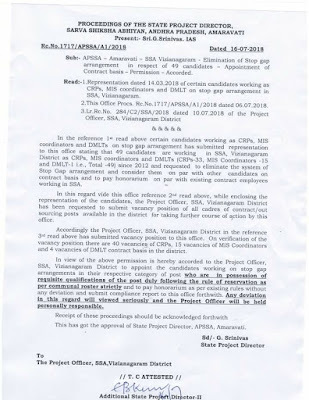 Sub: APSSA – Amaravati – SSA Vizianagaram – Elimination of Stop Gap Arrangement in respect of 49 candidates – Appointment of Contract basis – Permission – Accorded. Read: 1) Representation dated 14.03.2018 of certain candidates working as CRPs, MIS coordinators and DMLT on stop gap arrangement in SSA, Vizianagaram. 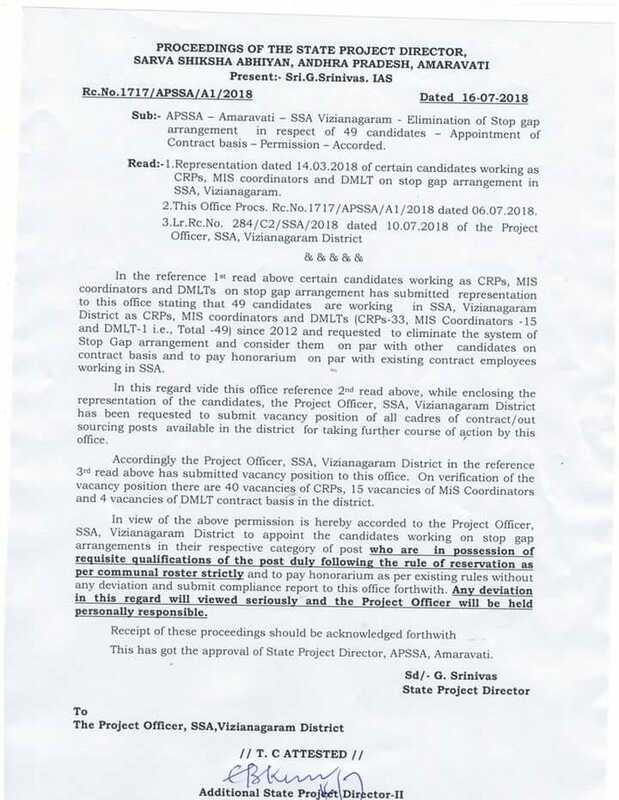 In the reference 1st read above certain candidates working as CRPs, MIS coordinators and DMLTs on stop gap arrangement has submitted representation to this office stating that 49 candidates are working in SSA, Vizianagaram District as CRPs, MIS coordinators and DMLTs (CRPs-33, MIS coordinators-15 and DMLT-1 i.e., Total-49) since 2012 and requested to eliminate the system of Stop Gap arrangement and consider them on par with other candidates on contract basis and to pay honorarium on par with existing contract employees working in SSA. In this regard vide this office reference 2nd read above, while enclosing the representation of the candidates, the Project Officer, SSA, Vizianagaram District has been requested to submit vacancy position of all cadres of contract/out sourcing posts available in the district for taking further course of action by this office. Accordingly the Project Officer, SSA, Vizianagaram District in the reference 3rd read above has submitted vacancy position to this office. On verification of the vacancy position there are 40 vacancies of CRPs, 15 vacancies of Mis Coordinators and 4 vacancies of DMLT contract basis in the district. In view of the above permission is hereby accorded to the Project Officer, SSA, Vizianagaram District to appoint the candidates working on stop gap arrangements in their respective category of post who are in possession of requisite qualifications of the post duly following the rule of reservation as per communal roster strictly and to pay honorarium as per existing rules without any deviation and submit compliance report to this office forthwith. Any deviation in this regard will viewed seriously and the Project Officer will be held personally responsible. Receipt of these proceedings should be acknowledged forthwith. This has got the approval to State Project Director, APSSA, Amaravati.